We are proud to say that for over eight years, kindhearted, skillful, and generous teachers and tutors from around the world have been providing teaching services in the English language and other subjects to our friends in Afghanistan. 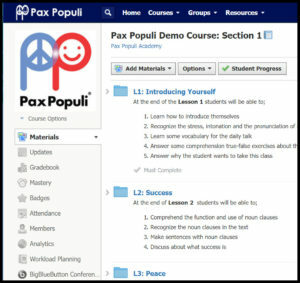 What began as the Pax Populi Tutoring in 2010 evolved into the online school, Pax Populi Academy (PPA) in 2014. [To visit Pax Populi Academy, please click here.] We believe there is no better means for advancing peace than through education, and to act on this, we have created our Academy that provides a framework for Afghan students to work with volunteer tutors and professional ESL teachers from around the world We have focused above all on English language learning, although on a limited basis we have also taught mathematics and sponsored students to study in respected universities. A Pax Populi tutor meets with his Afghan student. Student using Pax Populi Academy in Kandahar. 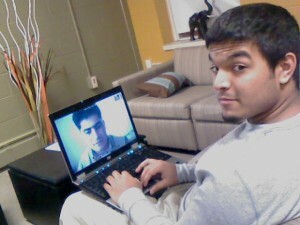 Through our online courses, online tutors meet with Afghan students using the “Zoom” videoconference program. After a screening process, volunteer tutors and students are provided with a brief orientation. They are then matched with one or two Afghan students who are studying at participating partner schools. After a schedule is established for the tutors and students, a Meeting Facilitator will initiate the sessions at agreed times, typically for one and a half hours or more. Our tutors have been located in many countries around the world, each tutor and tutee must adapt to the time zone differences between their locations. Sessions are usually held during Afghan working hours, which may be during the night or morning for the tutors. There is a growing curriculum of courses and in 2019 we plan to begin offering specialized seminars. Through the use of electronic documents, tutors and students are able to refer to the same materials in real time. Afghan participants may be teachers seeking to improve their English language abilities or students attending participating Pax Populi partner schools. Currently, our program is operating in the five of the largest cities of Afghanistan, Kabul, Kandahar, Mazar-e-Sharif, Herat, and Bamiyan. Previously, we have also worked with students in Kunduz and Jalalabad. An online lesson from Pax Populi Academy. Prospective tutors must be fluent in English and committed to working for peace through education in a way that is caring and respectful of the Afghan student’s culture. Typically, tutors are either ESL teachers or university students. Tutors use their own computers, which should have a webcam and a high-speed internet connection. Our tutors are located in Our tutors have been located in many countries including Greece, South Korea, Australia, France, England, and various states in the United States. Location is not critical — commitment and capabilities are. Tutors should be willing to commit a minimum of two hours/week for at least three months. Our Academy is small but growing. We are guided by a vision in which no one is denied a quality education due to war or systemic violence. In the 21st century, there are unprecedented opportunities to deliver educational services even in conflict zones; every day our work is a testimony to the capacity of dedicated people to provide valuable educational experiences in difficult conditions by drawing on modern technologies empower by human kindness. And in the process, both instructors and students are enriched by the exchange. If you are interested in joining our program as a tutor or student or if you are interested in Education for Peace or simply want more information please contact us at: info@appliedethics.org, use our contact page, or contact us through our Pax Populi Facebook Page. We also are in need of financial support to keep our school running. To donate, please click here. Be a Peacemaker: Pax Populi wants you!